While every personal injury situation is different, there is no specific guideline to follow when it comes to hiring a personal injury attorney. But trying to understand the legal process without an experienced legal team can be very difficult. If you or a loved one are trying to settle your personal injury case on your own, there may be a time when you need help from a New Jersey personal injury lawyer. Whether you are dealing with serious medical complications, difficulty navigating your claim or you have run into a roadblock with the insurance companies —having some extra help on your side can make a huge difference. During the personal injury claims process, there may be several different times where the advice of a knowledgeable attorney can come in handy. Coming to the realization that your personal injury claim is too much to handle on your own could happen at any point in the claims process. You could decide you need expert help at the beginning of the process or at any other time, as you work your way through filing paperwork. Whether the legal terms become too technical or you realize that trying to work with the insurance companies isn’t working, filing on your own can make things very hard to manage. Other times, accident victims may get a running head start into the filing process only to find later on that their injuries are worsening. This makes it much more difficult to dedicate time to the legal process. If you have severe or debilitating injuries, it's in your best interest to consult with a personal injury lawyer in an attempt to maximize your compensation. Your case doesn’t even have to be particularly complicated to need the help of a New Jersey attorney to guide you through the claims process. There is nothing wrong with knowing that taking on a legal case isn’t something that you feel particularly comfortable doing. Even if you begin to handle the legal matters on your own and later realize that it isn’t something you want to continue doing, an experienced personal injury attorney can help. A stalemate situation during a personal injury claim is never a good place to end up in. Sometimes, accident victims may be able to navigate the legal process all the way up until it’s time to reach a settlement with an insurance company, only to find that they aren’t willing to offer a fair settlement. 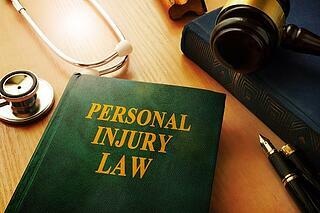 In these types of situations, consulting with a New Jersey personal injury lawyer is in your best interest. If you are not willing to settle for less than you think you deserve or you have a feeling that your claim is worth more than the insurance company is offering, you can choose to take your case to small claims court. Denial of Liability - It is very common for insurance companies to quickly deny that their insured party was at fault for an accident. They often attempt this power move in the hopes that accident victims will believe their findings. Or they hope that you'll become frustrated enough to give up on your claim entirely. If they refuse to reconsider their initial findings, you may need to work with a lawyer to help show the insurance company that you are serious in pursuing the case. Denial of Coverage – Insurance companies may also state that this type of accident is not covered by the insurance policy that was in place. If this happens, it is important for accident victims to request a copy of the policy and go over it carefully. Most insurance policies can be interpreted in different ways, so enlisting the help of an attorney to go over the policy may be in your best interest. Government Immunity - Additionally, there are situations where government immunity can make it hard to file a claim. If an accident was caused by an employee of a school or government entity, there may be state-specific laws in place that make the claims process extremely difficult. Even if you follow procedures to the state’s specifications, they may deny your request for compensation. In these situations, the help of a personal injury lawyer can greatly increase your chances of reaching a settlement in your favor. Sometimes, the success of your case can come down to understanding a legal rule. For example, you may have been injured on a cracked sidewalk and it may be hard to determine who is responsible for your injuries. Or your right to collect compensation from a business may depend on whether the responsible employee was acting within the course and scope of their employment. In instances like these, where a particular rule needs to be explained further before you can proceed, a skilled and knowledgeable attorney can greatly increase your chances of reaching a favorable settlement. With many years of combined experience and a dedication to helping personal injury victims take home the maximum settlement available to them, the team at Scura is here to help you navigate your personal injury claim. Whether you’re at the very beginning of the filing process or you’re stuck in a stalemate with the insurance companies, we can help you get the settlement you deserve. Our aim is to help you win your case so that you can focus on healing and enjoying a better quality of life. For more information on how our New Jersey personal injury attorneys can help, call (973) 870-0434 or visit us online today to schedule a free initial consultation.